This Delightful, detached stone cottage of historical interest lies within the substantial mature grounds of the owners period home. With open views over the surrounding rolling countryside and the Ochil Hills beyond this is the perfect setting to relax, unwind and explore Scotland. Located in a peaceful and tranquil setting, the cottage and has been fully and tastefully refurbished to provide very comfortable, two bed roomed accommodation sleeping up to six people. There are shops, garage, post-office, restaurants, pub food, 2 golf courses and an indoor swimming pool with sauna and spa all within 1 mile. 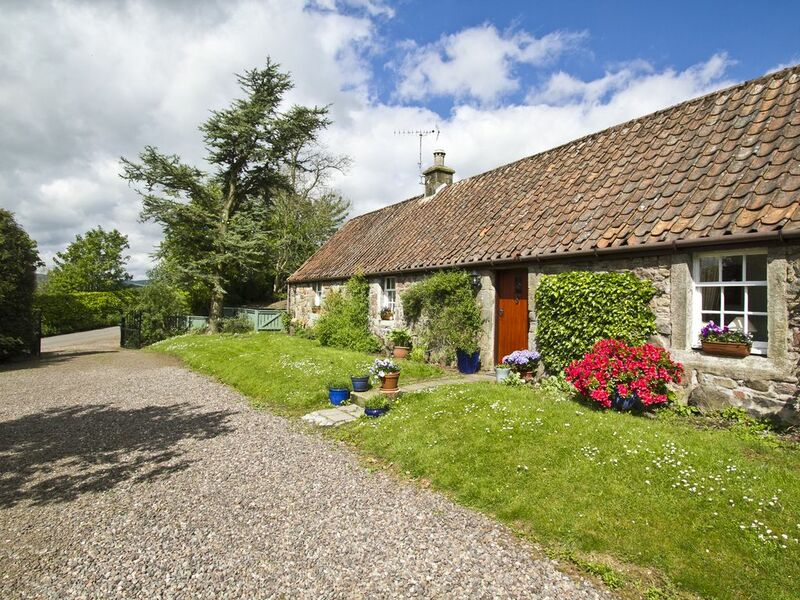 The cottage has got a lounge with polished wood floors, open beamed ceiling, log burning stove, French windows with views over farmland and the Ochil Hills opening out to patio seating area and barbeque. The kitchen is fully fitted and well equipped dining kitchen with 4 ring electric cooker, washing machine, dishwasher, tumble dryer, fridge freezer, microwave and Radio/CD player. The double bedroom with views towards the Ochil Hills this charming room has a pine, king size bed and pine furniture. The twin bedroom is a bright, spacious room with pine furniture and views over the garden. The bathroom is a white bathroom suite with electric shower over bath. The cottage is fully gas centrally heated and the system is designed to provide constant hot water. Large enclosed mature garden with private parking, garden seating and barbeque. There is a white traditional ceramic bath with an electric shower over the bath. The walls and floor are all tiled. There is a large wall mirror running above the traditional, white basin. There is a modern wall mounted towel heater. All bed linen provided. Weekly cottage clean / linen change for longer stays. Tumble dryer. Outdoor clothes line. Inside open out drying stand. Parking for 2 cars. Further parking in owners garden. WiFi available on request at £10/week, ask owners for password. All towels provided. Weekly cottage clean towel change for longer stays. Cosy wood burning stove. Logs available locally for purchase. Large standing fridge with sizeable freezer compartment. Double electric oven. Main oven a fan oven, smaller one double up as a grill. Filter Coffee Maker. Also cafetiere. Fully stocked with Denby pottery dinner service. Fully equipped with utensils, cooking knives, pots and pans galore! Beautiful Pembroke dinning table in dinning room. Circular dinning table with garden views in kitchen. If you are considering staying at this property, then book it now. It was our first holiday with our 6 month old daughter and Kate provided everything that we needed. Nothing was a trouble and even looked out for our sad dog, Millie, who got a tad upset at being left alone. The garden available is second to none, truly stunning. Any green finger people will be in envy at this magnificent array of flowers, trees and plants. As the weather was really good, we didn't get to make use of the log burner in living room, but what a feature. Kitchen had everything that you'd need to cook an almighty feast with and both bedrooms were homely and welcoming. We went to deap sea world, 25mins away, Loch leven, not even 15mins away and Perth, 20 mins away. The local village was only a 30 min walk away, where we'd highly recommend the thistle Hotel for a drink as the locals were so welcoming. The Chinese along the street also hit the spot. Having stayed at various places that allow dogs, this wonderful home from home wipes the floor of all others. I know what it's like reading a blurb for a place and wondering if it's true, listen to this and let Kate and her friendly family take care of your next holiday. Angus, Lauren, Jessica and Millie the dog. Very comfortable, well-equipped cottage in a beautiful setting. Spotlessly clean and with everything we needed for a few days' relaxing break. Kate was very welcoming and friendly (as were the animals!) and it was lovely to see the hares playing in the fields behind the cottage. Wouldn't hesitate to recommend it to friends or family and certainly hope to visit this gorgeous part of the country again. This was our second winter visit to Ballingall Cottage and we enjoyed it as much as our first one, two years ago. The cottage is a true gem. Comfortable in every way, well decorated and spotlessly clean it really is a home away from home. The sitting room has a very effective log burner which coupled with the central heating makes it very cosy. We were made to feel very welcome from the moment we arrived to the moment we left. It snowed quite a bit while we were there and that cut down thr amount of walking we would normally do but it was very easy to just relax and watch the snowflakes fall.. There are lots of eating places near by and a really good supermarket about 2 miles away. Visit number three will not be long in coming. I went with my wife, mother and baby (3 months old ). We were concerned about taking the baby to a new house and the facilities and heating etc but there was no need. The house was excellently equipped and we cooked most nights using local produce. The butchers in Kinross is very good. The house was warm and the log fire a lovely touch. For a two bed cottage the space in all of the rooms particularly the lounge was brilliant especially considering the vast amount of baby items we brought with us. We had a thoroughly enjoyable stay and would recommend to all. On a side note we left a few items and Kate was more than happy to post them back to us something we were very grateful for. My sister and I wanted to bring our mother out of Germany for the first time (over 80 but still fit). After checking several locations we found this nice cottage. We stayed for 10 days and didn't regret it one bit. First the central location. You are near but not to near a motorway and other streets which can bring you everywhere in Southern Scotland in around 1 hour. We took for example a visit to Glasgow, Edinburgh, Stirling and a few other historical buildings. If you mainly use the Kitchen instead going to eat outhouse, several supermarkets (Kinross) and stores in direction of Edinburgh are available. Second the Cottage itself. I can only speak for us, but we felt directly at home. The livingroom was cozy, the beds really comfortable, the kitchen nice and convient. The Bathroom was suitable and everything was clean. The garden-furnishings could need a little love but with nice cushions and Tablecloth this wasnt really an issue. Of course there were signs of usage but this didn't really bother in the overall impression. Since the fields begin directly behind the cottage I was waked up a few times by pheasants directly before the roomwindow. As a city peron I found this really relaxing. The Internet was good for the location so normal surfing isnt an issue. Even Netflix is possible (like on Rainy days) if someone isnt bothered by the lowest quality/ small lagging and nothing interesting is on the normal television. The Landlords are really nice and helpful. If we noticed something they helped or provided it on a shortcall when possible. (Things like a bathmat, or explaining things). The cat and dog they have are also really friendly an greet everyone when the are out in the yard. Overall we really enjoyed our stay there and it is not unlikly that we visit there a second time. Ballingall cottage is a lovely place in great surroundings, Kate is a great host and we have a fantastic week there, would highly recommend! 15 miles from Gleneagles, 10 minutes walk from Ryder Cup East Park'n Ride at Balado/Kinross - a perfect Ryder Cup destination. Many golf courses nearby and a fantastic central location for touring Scotland to visit Edinburgh, St Andrews, Stirling, Perthshire and the Highlands, it doesn't get much better than this. There are a wide variety of activities on your doorstep. In addition to the two local golf courses there are 100 others within 1 hours drive away. You can enjoy many interesting walks or cycle runs around the loch to visit the surrounding local villages and historical beauty spots. Rainbow and brown trout fishing takes place at Loch Leven where fishing boats may be hired daily. Loch Leven is a National Nature Reserve that attracts 15000 geese and wild fowl every winter. The diversity of the bird life may be fully appreciated at the RSPB's Vane Farm Visitor Centre. In the middle of the Loch stands the impressive Loch Leven Castle where Mary Queen of Scot's was imprisoned. Daily ferry trips to the Castle Island take place from April to October where visitors may explore the castle. Other activities and interests include tennis, para-gliding, hill walking, Sunday Market, Pottery and Craft Centre. NB. • The rates are fully inclusive of all bed linen, towels, gas and electricity except from 1st Oct - 31st March when a winter fuel supplement of £40/week is payable. • Rental periods run from Saturday to Saturday with the exception of Christmas & New Year weeks. • Contact the owner for short break prices A winter fuel supplement of £40 is payable between 1st October and 31st March To avoid Home Away service charges please book directly with the owner.